Neil and Gwen Wetzig will continue to working alongside HEAL Africa Hospital (HAH) staff until the end of this month and then return to Australia. What is a typical day like for them now that the other AusHEAL team members have departed? Neil rises at about 5.30am and goes for his morning run at least 3 days per week. It is not like running in Australia, involving dodging potholes in dirt roads, motos (motor scooters) who come too close as there are no footpaths, and the early morning traffic of young people (mostly women) who carry up to five 5-gallon plastic containers to Lake Kivu to pick up water for the family and return with them full. Then there are the occasional bicycles loaded with even more yellow plastic containers – not to mention the various vehicles of NGOs on the road at that time of morning. With at least 250 NGOs working in Goma there are many 4-wheel drives with their particular NGO’s insignia on the side. 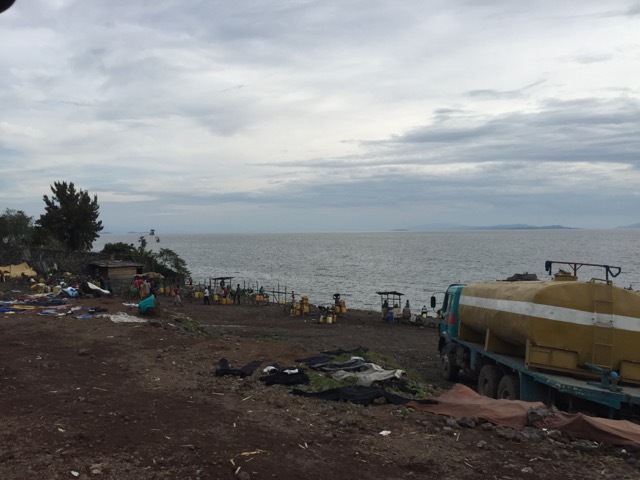 The run takes Neil past the public beach on the shore of Lake Kivu from where the water is obtained, down past the Governor’s offices (used previously as the then President Mobutu’s summer residence). 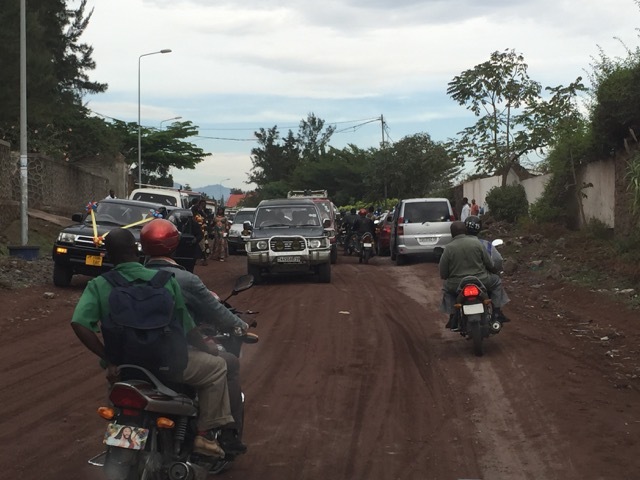 The run is also an informal security check on the tone of the people and Goma for the day. The Nyiragongo volcano may be seen as the sun rises depending on the route taken. On return the armed police guard who ushered Neil out of the Maji Matulivu compound gate lets him back in. 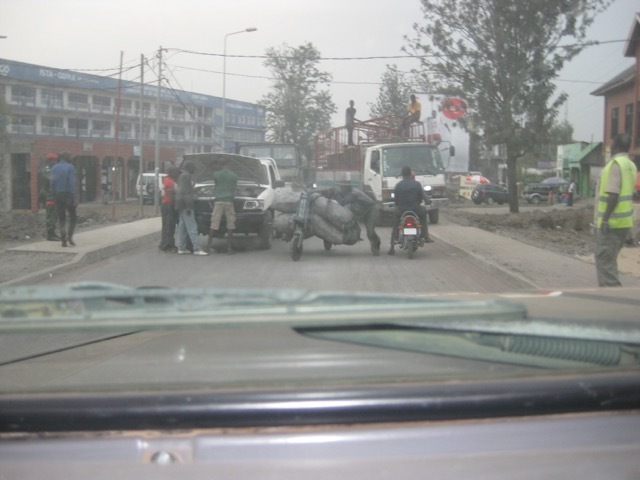 Workmen at Maji Matulivu are washing down the 4-wheel drives most days with the Congolese priding themselves in keeping things clean in the midst of Goma dust. After showering, breakfast is served in the dining room at Maji with a slice of omelette fruit and maybe cheese as well as rich dark coffee! Water carriers on the early morning road. Minimal footpath. The drive from Maji to HEAL Africa hospital begins about 7.40am. It can be quite stressful, again dodging potholes, motos, 4-wheel drives and workers walking to their place of employment without caution as they cross roads. Matatus, simply called buses in Goma add to the group. They are grossly overloaded vans. Moto drivers sometimes choose to go around the round-about the wrong way, driving dangerously into the face of on-coming traffic. The bikes swarm around a vehicle like mosquitos! Contrastingly UN armed patrols on the road travel slowly. With the crush of traffic passing them becomes a challenge. Entering the hospital greetings have to be made to the many varied staff. Such an important and vital part of the Congolese culture. The HEAL Africa hospital ‘family’ is so friendly as we meet them. The AusHEAL in-country office is where bags are left, the white coat donned and then off to either the morning staff meeting (Monday, Wednesday and Saturday) or a ward round commencing in the Intensive Care Unit. From there to the operating theatre on Monday, Wednesday and Thursday or to a longer teaching ward round or outpatient clinic on Tuesday and Thursday. Operating lists vary from day to day ranging from new born, to infants, older children and adults. Diseases treated vary as well with age group. Meanwhile Gwen may start by working on AusHEAL/HEAL Africa processes to ensure that AusHEAL is a responsible not-for-profit organisation and a good partner with HAH. Later she may download emails, respond to them or meet with HAH staff and conduct informal English lessons during the discussions. She has a number of projects she is currently working on. 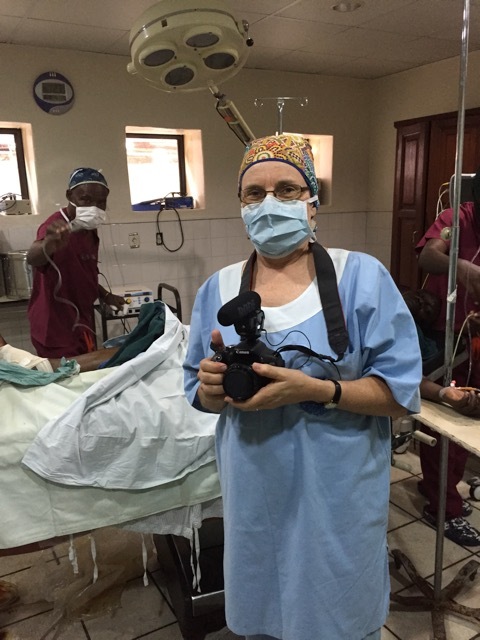 This week she was also able to come to the operating theatre with Neil and film procedures for advocacy purposes. Neil and Gwen leave for Maji at about 5pm or later and brace for the equally, stressful drive home. The return route involves getting through at least 2 major intersections where no road rules seem to be followed. Returning to Maji Matulivu a shower follows computer work, then dinner at 7pm. As stated in previous blogs, discussions around the dinner table are quite interesting with so many varied people staying at Maji. There may be a hydro-electric power engineer working in Virunga National Park, a researcher on governance in D.R.Congo, a TEAR Fund worker training in ‘Transforming Masculinity’ to deal with the sexual violence issues rife in north east Congo, or another WASH Consultant (water and sanitation). Conversation is particularly lively and informative when Dr Jo Lusi, the founder of the HEAL Africa organisation and hospital, is at dinner. New things about Congo and culture are learned most nights. Returning to our room there are reports to write, lectures and teaching to prepare, and French to try to study. Lights out occurs around 10pm (or later). Lighting is better than past years due to solar power. Mains power comes on-and-off irregularly during most days. As sleep follows, one hears the refreshing sound of waves on the edge of Lake Kivu. It is difficult to believe that life goes on for another day in one of the poorest countries in the world. We have a lot to be thankful for!